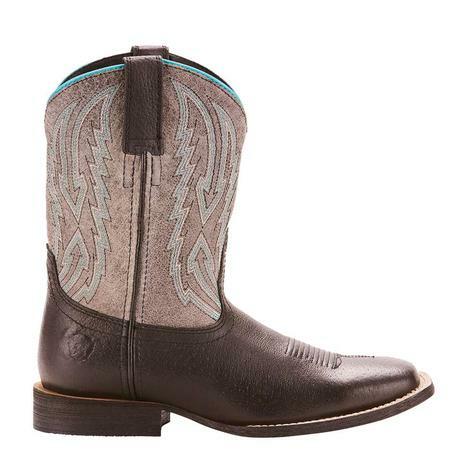 Ariat Kids Lightning Blue Tombstone Cowboy Boots have the clout that the big guys boots have just in a smaller size. 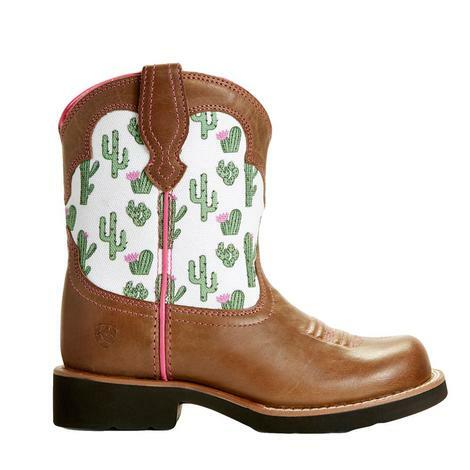 Great looking to put with the school and show jeans and still have an awesome made boot to hold up through the growing season. 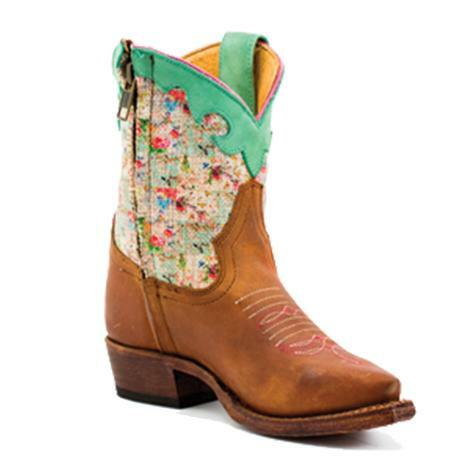 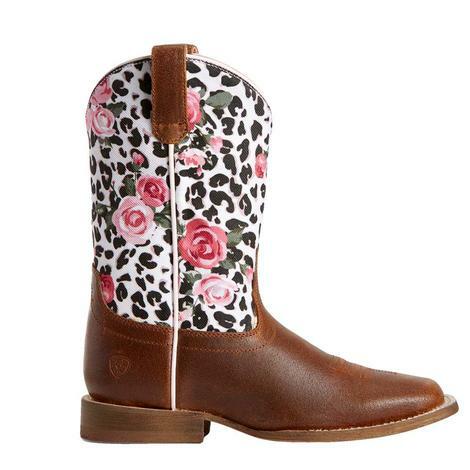 These pretty kids boots by Macie have a beautiful multi-colored floral print shaft with a honey crazyhorse leather vamp. 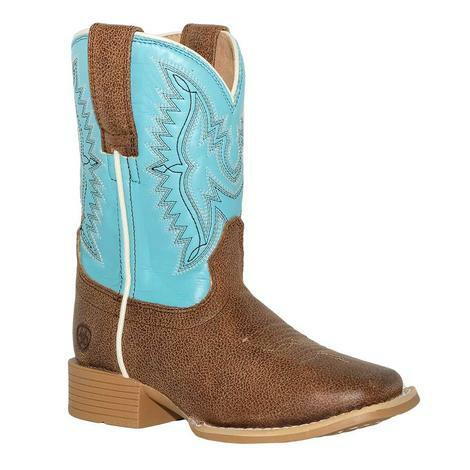 The shaft is accented with a mint green collar and the vamp has a snip toe design. 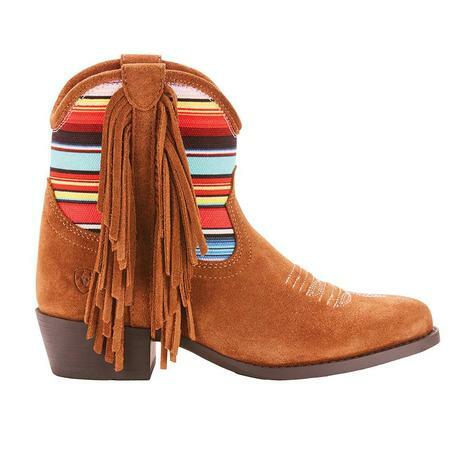 Sits atop a cowgirl heel. 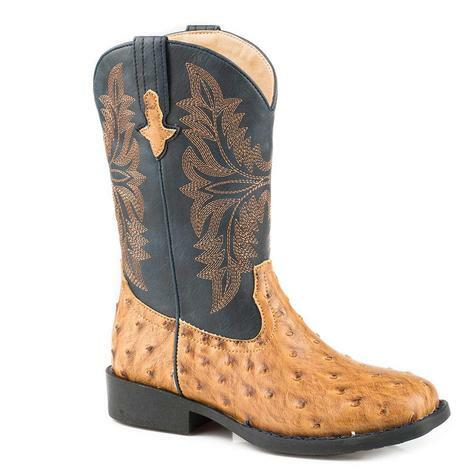 These youth boots by Roper are adorned with filigree and cross inlays with studded detail throughout. 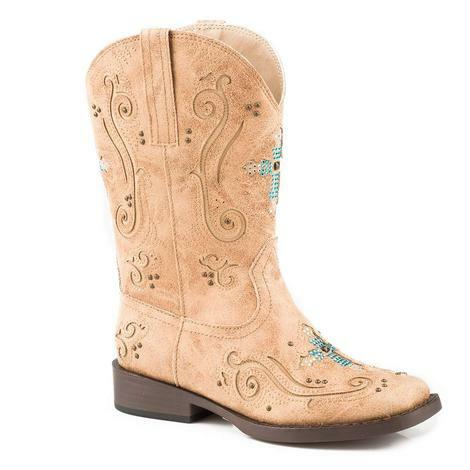 The crystal accents sparkle every time she takes a stepstep. 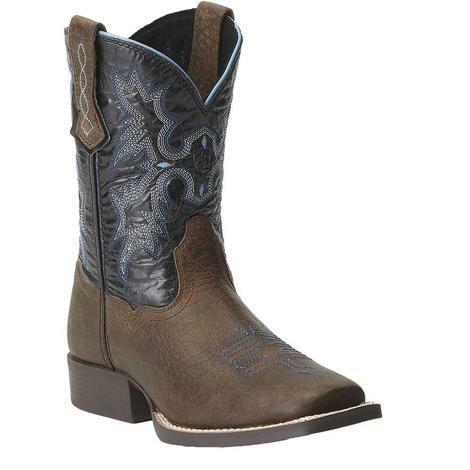 These Roper boots are designed with comfort, durability, quality materials and craftsmanship in mind! 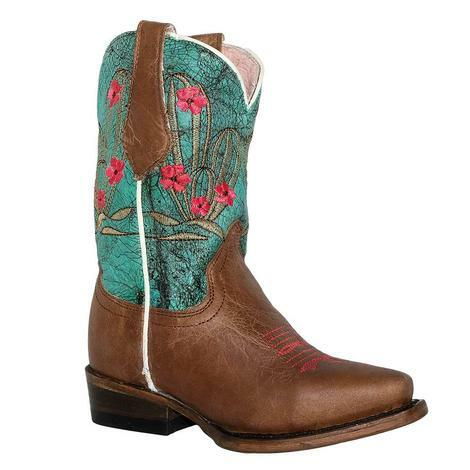 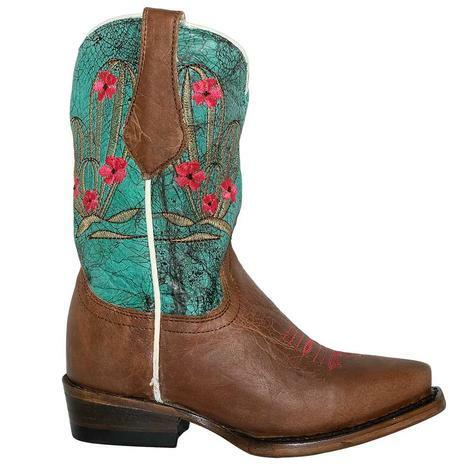 The boots have a beautiful embroidered cactus design on turquoise leather shaft. 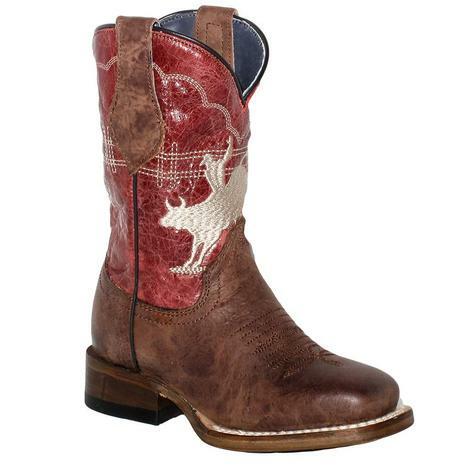 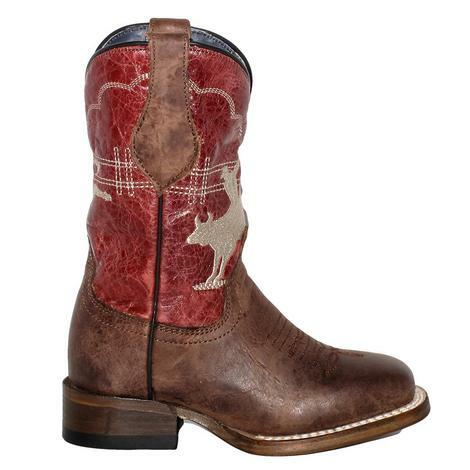 These genuine leather boots by Roper have a contrasting vamp and shaft with embroidered bull rider motif. 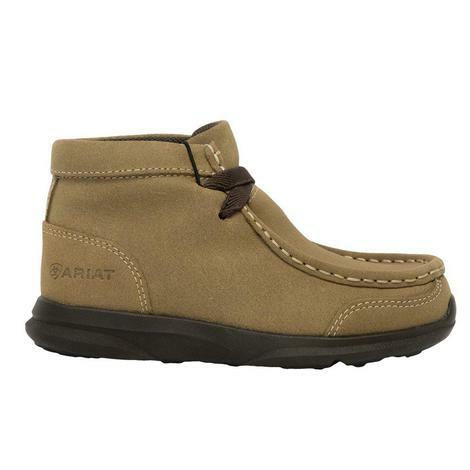 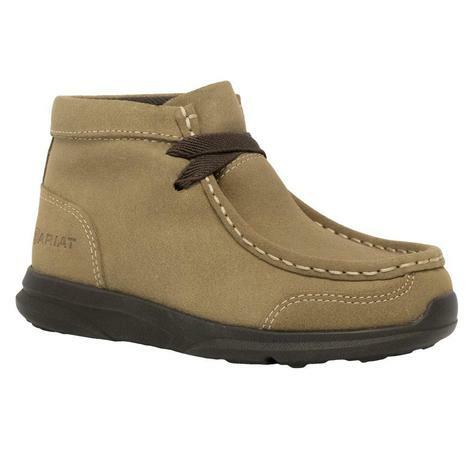 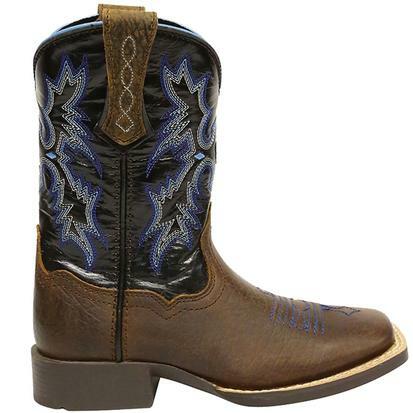 This boot also has a removable insole, walking heel and square toe design for lasting comfort. 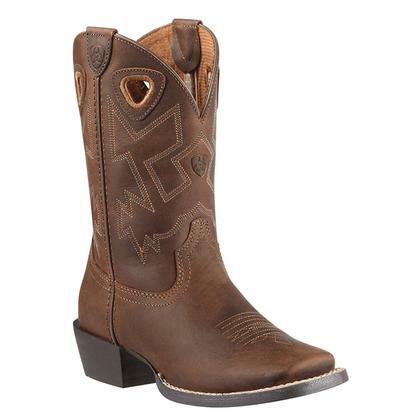 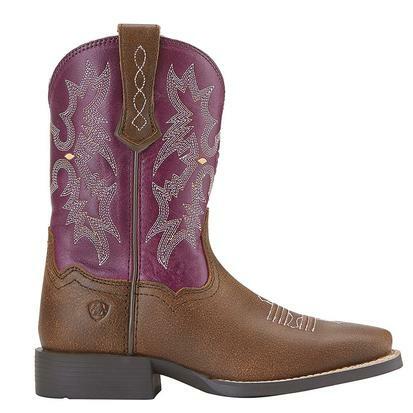 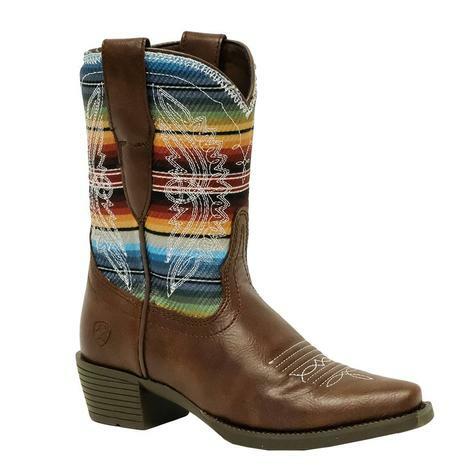 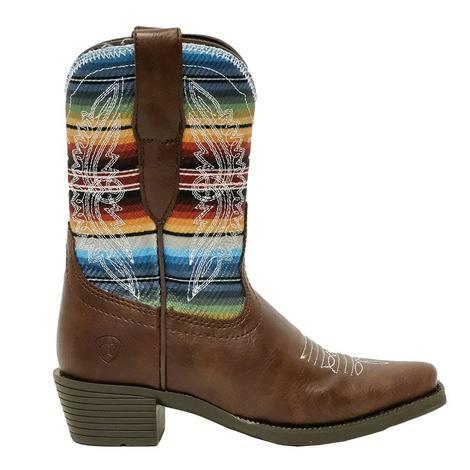 This youth boot by Ariat has a beautiful serape shaft with intricate contrast stitching with the Ariat logo shown. 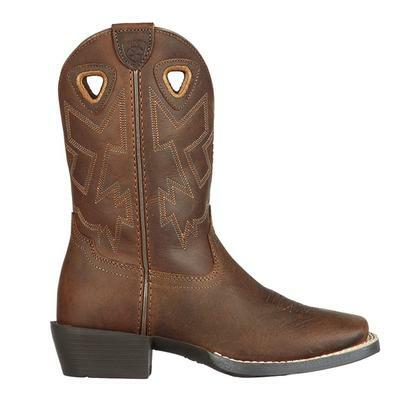 The vamp is brown and the boot sits on a 1.125 inch heel. 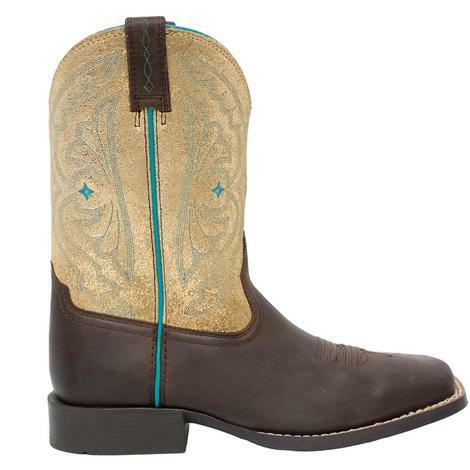 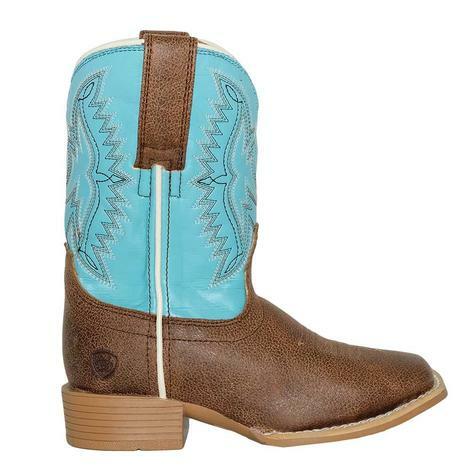 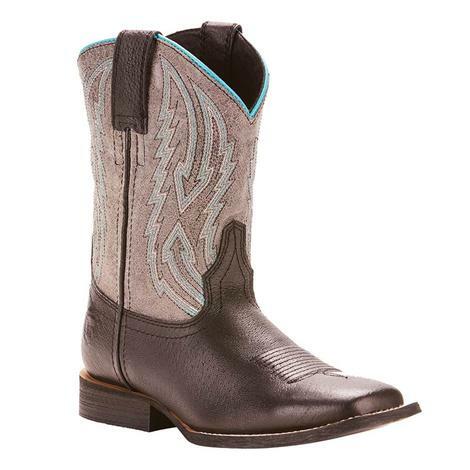 These boots by Ariat have premium leather construction and a unique turquoise piping and stitching along the upper. 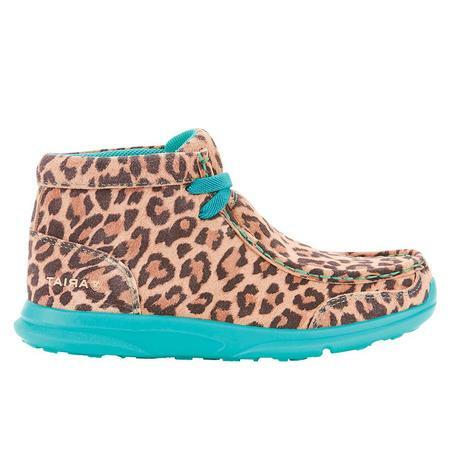 The 4LR technology will cushion her feet for all-day comfort and unparalleled support. 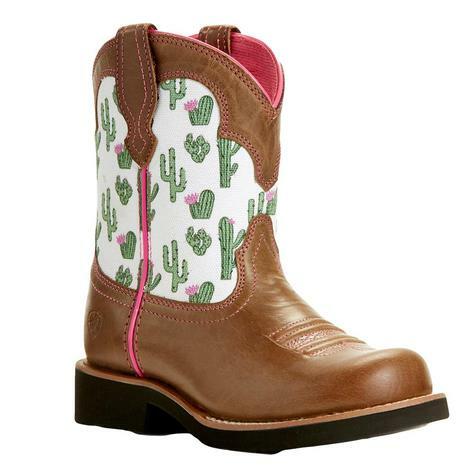 Add these to your little cowgirl's collection today! 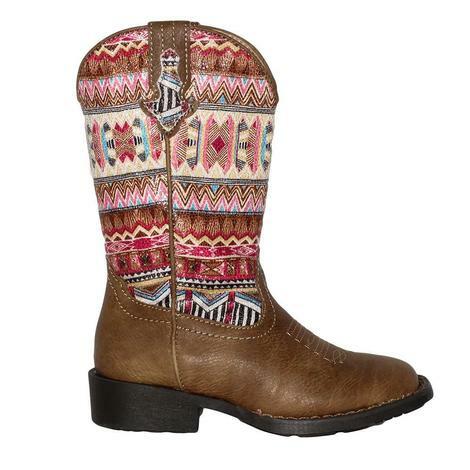 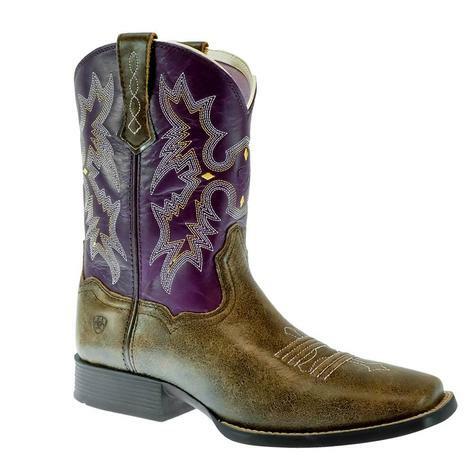 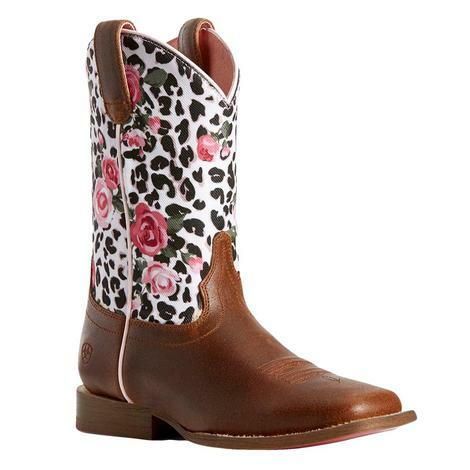 This girl's boot by Roper has a Aztec print shaft that's sure to grab everyone's attention in the room. 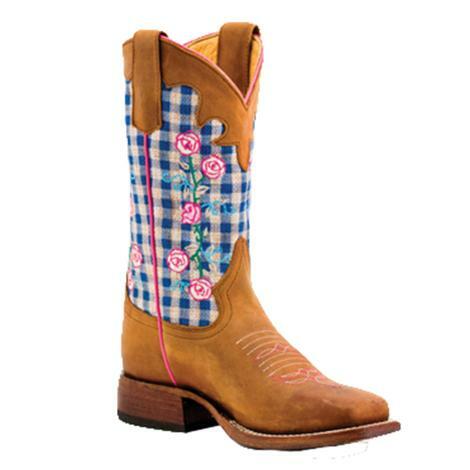 This youth boot by Macie Bean has a honey crazyhouse vamp with a blue checkered shaft. 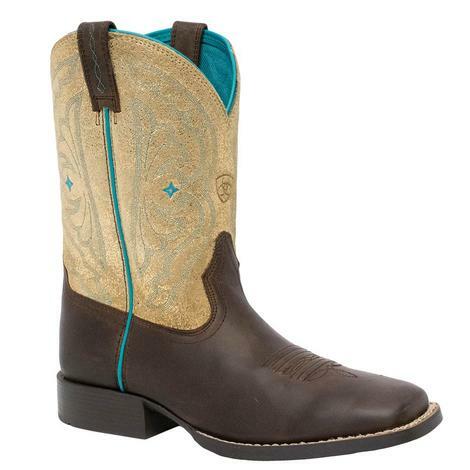 Rope embroidery on the shaft gives this boot a on of a kind look. 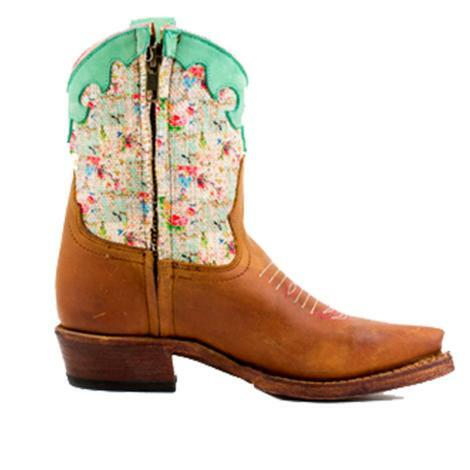 Sits atop a roper heel. 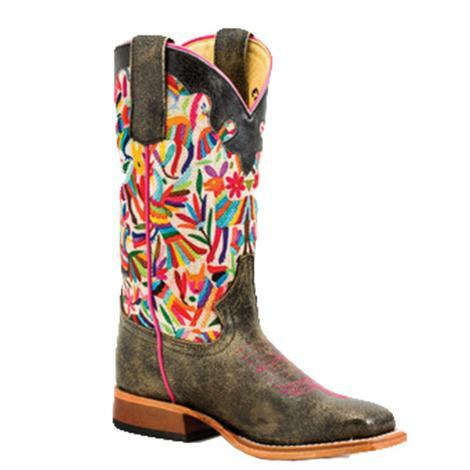 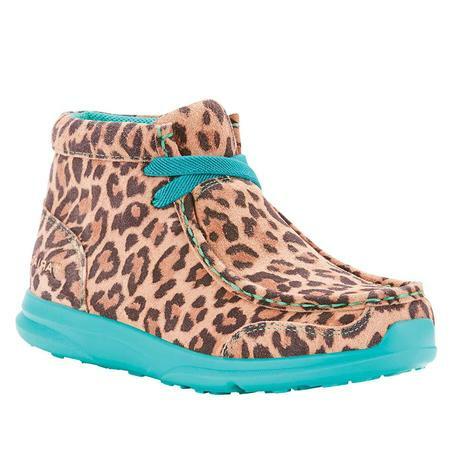 This colorful girls boot by Macie Bean has a pretty multi-colored otomi shaft with a black cracktacular shaft. 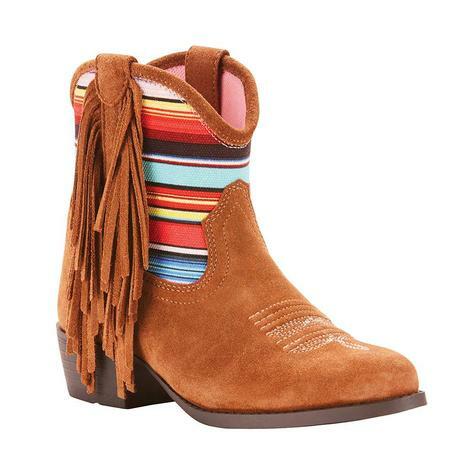 Sits atop a roper heel.